The Griffin pub with the Whetstone visible in the foreground. Barnet council offices dominate the centre of Whetstone. Whetstone is a place in the London Borough of Barnet, bearing the postcode N20. It is to the east of Totteridge, and these areas are known together as Totteridge and Whetstone. 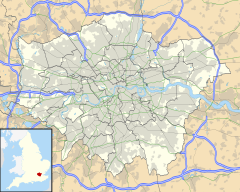 This combined area was at the outset of the 21st century found to be the 63rd-richest of the more than 9,000 wards of the United Kingdom, an acclamation which can be credited to Totteridge Lane, a long rural road that is home to many multi-millionaires. The High Road, the main road in the area, is the A1000 and part of the traditional Great North Road from London to Edinburgh. Until the late 19th century its tiny developed area was one of two main settlements in the ancient parish of Friern Barnet, the other being Colney Hatch. In medieval times the Hospitallers had a settlement nearby in Friern Barnet probably where Friary Park is now and alongside the old road to London. In 1340 the Bishop of London opened a gate into his park (the Highgate) which enabled a straight road across Finchley Common along the ridge there. The Hospitallers' settlement moved further west and became known as West Town, also known variously as "le Weston" (1398), "Wheston" (1417), and "Whetstonestret" (1439). Until the late 19th century its tiny developed area was one of two main settlements in the ancient parish of Friern Barnet, the other being Colney Hatch. Friern Barnet remained its ecclesiastical parish and its civil form was at that time giving way to urban and rural districts, in this case Friern Barnet Urban District. John Heathfield of the Friern Barnet & District Local History Society writes that according to the Royal Commission on the Historical Monuments of England, the stone outside The Griffin public house commonly known as the Whetstone, is a mounting block, and if so "it would have been connected to the toll gate erected by the Whetstone & Highgate Turnpike Trust about 1730." He also states that the earliest evidence for the existence of the stone is a photograph taken in 1861 which shows it much closer to The Griffin than it is now. The stone was moved to its present location when the toll gate was removed in 1863. Until the late 19th century this was the northern hamlet, centred on a crossroads, of the medieval parish of Friern Barnet which stretched 3 miles (4.8 km) south-southeast and was half as wide as long. The very rural parish until then had one other main population centre, equally a hamlet, Colney Hatch. Whetstone may have been the location of a Soviet spy base. Tass, the Soviet news agency, had a radio monitoring station at The Lodge, 13 Oakleigh Park North, and the British security agencies became aware that it was being used to track its activities. According to local newspapers, the diplomatic immunity granted to the Russians was a worry for the British government since it effectively granted a licence for Tass to publish libellous newsletters without the threat of prosecution. Despite this concern, the Soviets were subsequently granted permission to use specialist radio equipment which was then used to spy on the British. The matter was escalated to Prime Minister Clement Attlee and was discussed by senior members of the cabinet, and the Russians were eventually ordered to cease their radio monitoring operation. ^ "Living in Whetstone". Retrieved 14 November 2013. ^ a b "Whetstone Notes", John Heathfield, Friern Barnet Newsletter, No. 57 (April 2014), p. 4. This page was last edited on 12 March 2019, at 17:26 (UTC).